My lesson on the words, affect and effect began on a Friday over coffee and Shakespeare. I circled it in blue ink. There was effect used as a verb! Surely it had been a misprint. Or at least I had unearthed some archaic use of the term. Effect is surely never used as a verb, I thought. I raised this point with my friend, who has been reading “Much Ado About Nothing” with me. He assured me the usage was correct. Affected by this revelation, I looked it up on my phone while he stepped away. Hoping to have an effect on my friend, to persuade him to think differently about this usage, my search led me to grammarist.com. The online handbook pointed to a less common use of effect, which “does function,” though seldom, “as a verb when it bears the sense, to bring about.” I blushed a little when I found I had been wrong. I told my friend about the discovery that had effected my change of heart. Effect is, in fact, seldom used as a verb, though many a careless writer has shown a propensity for using it as a verb incorrectly. Perhaps it’s this chronic misuse that has affected grammarians to produce an array of tutorials on the subject. “Affect” is generally used as a verb: A affects B. The eye-patch affected my vision. In this sentence, the eye-patch (A) influenced my vision (B). 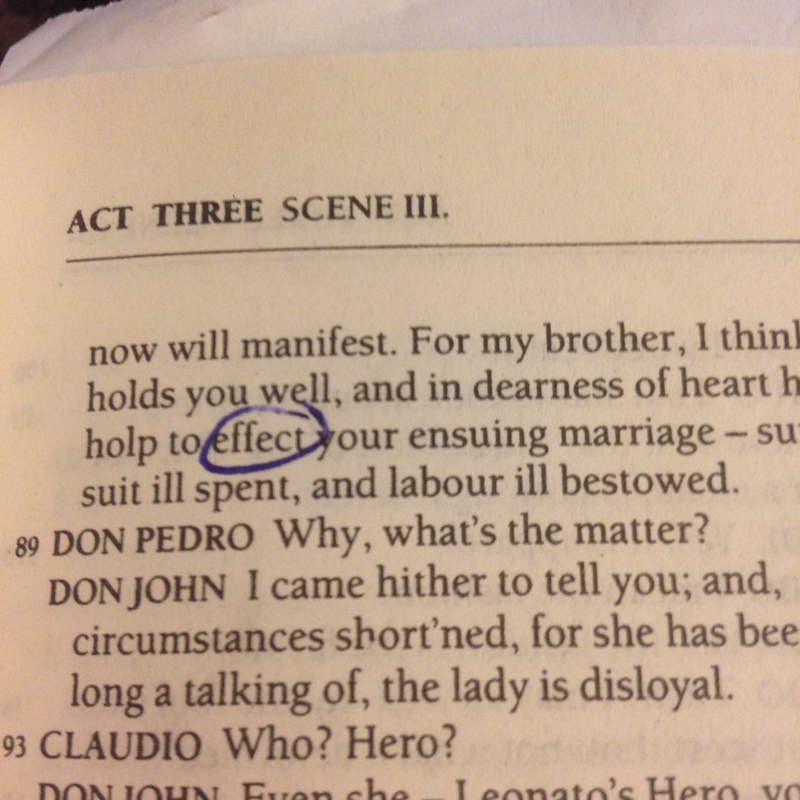 “Effect,” on the other hand, is almost exclusively used as a noun: A had an effect on B. Acting like a pirate has had a negative effect on my social life. “As a noun, means “result”; as a verb, means “to bring about,” to accomplish (not to be confused with affect, which means “to influence”). According to The Associated Press Stylebook, “affect, as a noun, is best avoided.” The list of references available to help clarify any confusion on usage goes on and on. Grammarians have invented a slew of mnemonic devices to help paper writers, bloggers and all sorts of amateurs distinguish between the two terms. The blogger known as “Grammar Girl” even has this handy cartoon about an aardvark to help us remember the difference. But as I’ve demonstrated, rules have exceptions. If these aids fail to take effect in your mind, or if the difference between affect and effect so affects you that you can’t choose the correct word, I’d suggest consulting your dictionary to be sure. Otherwise, the effects could be devastating.